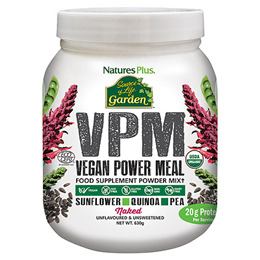 Nature’s Plus VPM Vegan Power Meal supplies high-quality protein, an essential nutrient with numerous benefits to multiple systems of the body. Protein helps to contribute to growth and maintenance of muscle mass, as well as to support the maintenance of normal bones. (acerola, beet, bilberry, blueberry, broccoli, carrot, cauliflower, chlorella, cordyceps, kale, maitake, parsley, shiitake, spinach, spirulina, tomato. Organic Non-GMO Protein Blend (Sources: sunflower*, pea*, quinoa*), thickener (guar gum*, acacia gum* [Acacia senegal]), Whole Food Blend*, Algas calcareas*, annatto extract* (Bixa orellana seed), blend of guava (Psidium guajava fruit), holy basil (Ocimum sanctum leaf) and lemon extracts* (Citrus limon peel), guava extract (Psidium guajava leaf), amla extract* (Phyllanthus emblica fruit), Mushroom Blend (Pleurotus ostreatus, P. eryngii, P. nebrodensis)*, moringa extract* (Moringa oleifera leaf), natural beta carotene (31 mcgRE), mustard extract* (Brassica nigra seed), cholecalciferol from lichen, zinc oxide, Citrus limon peel extract*, calcium pantothenate, vitamin K2 (menaquinone-7), chromium chloride, folate (as calcium-L-5-methyltetrahydrofolate), biotin, potassium iodide, manganese sulphate, sodium molybdate, methylcobalamin. *Organic. As a food supplement for adults, add one heaped scoop (included) of Organic VPM Powder to 296ml of water, almond milk, juice or smoothie and mix (or shake) until smooth. Add more liquid to desired consistency. For best results liquid should be very cold. This product is sold by weight, not volume, therefore settling of contents may occur during shipping and handling. Below are reviews of Source of Life Garden VPM Naked Protein - 630g by bodykind customers. If you have tried this product we'd love to hear what you think so please leave a review. Very palatable and easy to take. Seems to giving me a bit more energy. Very much now part of my morning routine. 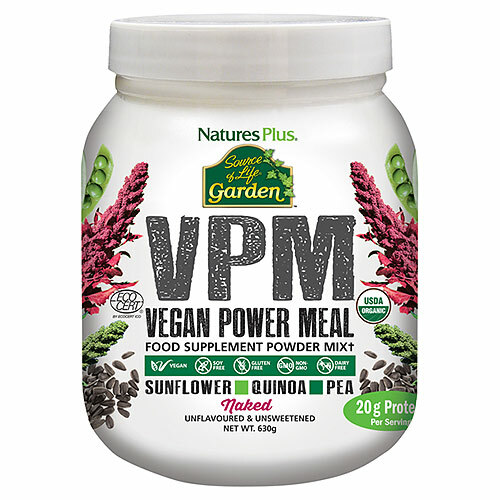 Nature’s Plus VPM Vegan Power Meal supplies high-quality protein, an essential nutrient with numerous benefits to multiple systems of the body.